If you have a long-term goal of reaching a one million dollars, then stocks are still one of the best options for reaching that goal. A stock market down-turn can send shivers down your spine, but the best time to actually purchase stocks and get the best deals is when the market is down or beat up. How long will it take to reach a million dollars? 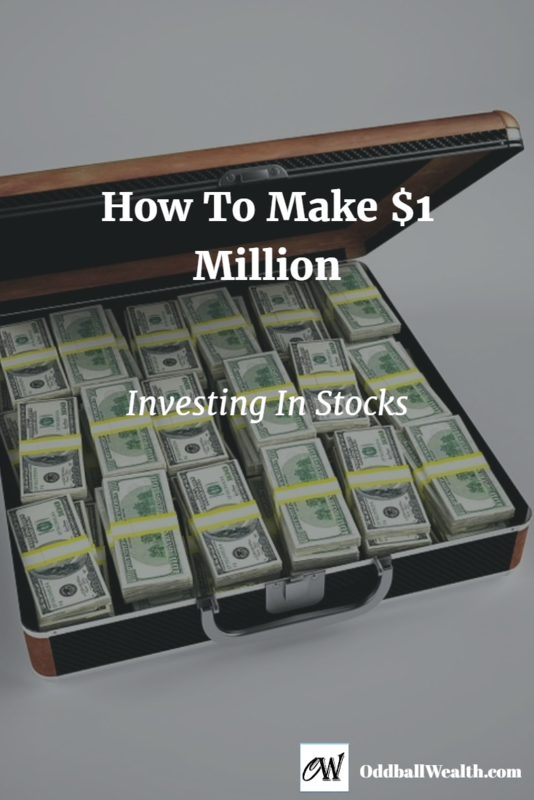 How long it actually takes you to reach one million dollars or more, greatly depends on how much you begin with, how much and how often you add to your investing portfolio, and how much you earn over time on your investments. If you took a $50,000 lump sum and invested it into the stock market, in less than 32 years’ time, that lump sum investment would turn into $1 million. This is based-off U.S. stocks having an annual return of 10 percent over the long-term, including dividends. If you invested $10,000 per year into a tax-deferred account, it would take you 24 years to reach one million dollars. We’re currently seven years into a bull market, and since 2009 the prices of stock shares have more than tripled. Since high share prices make buying stocks more expensive, experts believe future returns from stocks to be slightly lower. In an article written by E.S. Browning, a reporter for the Wall Street Journal, he also agrees that we should expect lower returns from stocks in the future. Some experts believe over the next decade stocks will return an average of 6.5 percent. If this is true, investing $10,000 a year, it’ll take you 31 years to reach $1 million. During large market declines, you can take advantage of those declines by purchasing stocks at a discount, which in the long run can have nice payouts. The more share prices drop, the more opportunity you have to take advantage of buying discounted stocks. A good strategy to use to boost your gains and get higher returns is called “buying on dips.” How this strategy works is when the stock market drops 10 percent, you take advantage of the drop by buying. Then if the market drops another 10 percent, you purchase more. A big mistake many people make is they pull money out of the market when it drops, when instead that’s the time they should be putting money into the market. Stay disciplined through all markets and before you know it, you’ll have a million dollars! Thanks to the internet and advancing technology you no longer have to go through a traditional broker or financial advisor, who are expensive and inconvenient. Instead, you can now use an online discount stock broker or use a robo-advisor. Online discount brokers allow you to buy and sell stocks for a small commission per transaction and are very affordable. A great online discount broker which I personally use for buying and holding stocks is OptionsHouse. I’ve had an account with OptionsHouse for almost 9 years now and have been completely satisfied with their service and trading platform. They only charge $4.95 per stock trade, that’s it, there are absolutely no other fees associated with the account and is one of the many reasons I’ve used them for so long. Robo-advisors, short for “robotic investment advisors,” are very similar to traditional investment advisors, except robo-advisors have been proven to be more effective and only charge a fraction of the fees as to what a traditional financial advisor would charge. Another nice feature robo-advisors have is they allow you to automate your investing, so you can set-it-and-forget-it. Betterment is probably the best robo-advisor available and I personally love their service. They only charge a 0.35 percent annual management for accounts that have a balance under $10,000, only 0.25 percent for accounts with a balance between $10,000 to $100,000, and only 0.15 percent for accounts with a balance greater than $100,000. My Betterment account is completely automated and doesn’t require any interaction on my part, as money is automatically deposited into my account every month, they invest it on my behalf based-off my preferences and automatically rebalance my portfolio for me. Read the full Betterment Review here. It sounds a lot like trying to time the market – buy when cheap, but who’s to say what is “cheap”? A better plan is to engage in dollar cost average investing. Pick an amount that you can afford and invest that same amount every single month, regardless of what the market is doing. Brad – MaximizeYourMoney.com recently posted…Is It Time For An Investing Fire Drill?